His full name is Waliuddin Abdurrahman ibn Muhammad ibn Muhammad ibn Abi Bakr Muhammad ibn al-Hasan, who later distinguished as the Ibn Khaldun. born in Tunisia on 1 May 1332 Ramadan H./27 732 M.
Is known as the father of sociology and Islamic historian who has memorized the Qur'an at an early age. As a political Islam, he is known as the father of Islamic Economics, for his thoughts about economic theory in a logical and realistic far been put forward before Adam Smith (1723-1790) and David Ricardo (1772-1823) put forward economic theories. Even as a teenager, his writings have spread everywhere. The writings and ideas of Ibn Khaldun was born as a very deep study, observation of various people familiar with the science and knowledge, and he lived in the midst of their extensive wanderings anyway. In addition to the tasks entrusted full of events, both joy and sorrow. He also has held positions in Fes, Granada and North Africa, and had been a professor at the University of al-Azhar, Cairo built by the Fatimids dynasty. From where she gave birth to the monumental works today. Name and his fragrant and is known throughout the world. The length of all if we are talking about the biography of Ibn Khaldun, but there are three periods that we can remember back in the course of his life. The first period, a period in which Ibn Khaldun demanding various fields of science. Namely, he studied the Quran, tafsir, hadith, fiqh proposal, tawheed, fiqh Maliki madhhab, science and sharaf Nahwu, balaghah science, physics and mathematics. In all areas of study to get a very satisfactory value of teachers. But the study stopped because the plague has hit southern Africa in 749 H. that claimed thousands of lives. His father and most of the teacher's death. He later emigrated to Morocco to Egypt the second period, he plunged in politics and had held various important positions of state such as Qadi al-qudhat (High Court). However, due to the slander of his political opponents, Ibn Khaldun was also thrown into prison. After released from prison, began the third period of the life of Ibn Khaldun, which concentrates on the areas of research and writing, he also complement and revise notes that have long made. As the book of al-'Ibar (seven volumes) he has revised and new chapters ditambahnya in it, the name of the book is also a Kitab al-' Ibar wa Diwanul Mubtada 'awil Khabar fi Ayyamil' Arab wal 'Ajam wal Barbar wa Man 'Asharahum min Dzawis Sulthan al-Akbar. Austria that provides enlightenment for modern sociologists. 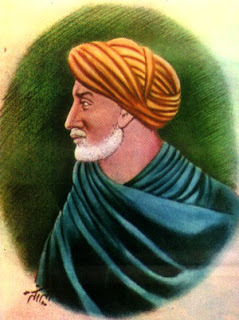 Other works of Ibn Khaldun such high-value, at-Ta'riif bi Ibn Khaldun (an autobiographical book, notes from the book of history); Muqaddimah (introduction on kitabu al-'Ibar is patterned sociological-historical, and philosophical); Lubab Muhassal fi Usul al-ad-Dien (a book about the problems and opinions of theology, which is a summary of the book Muhassal Afkaar al-Mutaqaddimiin wa al-Muta'akh-khiriin works of Imam Fakhruddin ar-Razi). DR. Bryan S. Turner, professor of sociology at the University of Aberdeen, Scotland in his article "The Islamic Review & Arabic Affairs" in the 1970's to comment on the works of Ibn Khaldun. He stated, "The writings of social and history of Ibn Khaldun was the only one of the intellectual tradition that is accepted and recognized in the Western world, especially the experts in English sociologist (who wrote his works in English)." One writing a very prominent and popular is Muqaddimah (introduction) which is the most important books on social sciences and is still studied today. In fact this book has been translated in various languages. Here Ibn Khaldun analyzes the so-called 'social phenomena' with method-the method that makes sense that we can see that he will master and understand social phenomena. In chapter two and the three, he talks about the symptoms that distinguish between primitive society with modern society and how the system of government and political affairs in the community. Chapter two and four to talk about symptoms related to the gathering of people and explain how the influence of these factors and the geographical environment on these symptoms. The fourth chapter and to five, explained about the economy in the individual, society and state. While talking about the sixth chapter paedagogik, science, knowledge, and tools. It's amazing all the work in the 14th century completely explain the happenings of sociology, history, economics, science and knowledge. He has formed and explain the disappearance of the countries with the theory of history. Ibn Khaldun believes strongly so, that basically stands for countries dependent on first generation (founders) who have the will and the power to establish a state. Then, followed by the second generation who enjoyed stability and prosperity that left the first generation. Then will come the third generation that grew towards peace, joy, and seduced by the material so that little by little spiritual buildings weakened and the country was destroyed, either due to internal weaknesses as well as assault powerful enemies from the outside is always watching weakness. THERE ARE some important notes from here that we can take the lesson material. Ibn Khaldun uphold science and will not underestimate a history. He was a tireless researcher on the basis of science and knowledge. He would always take the communities. In addition to a top official, he was a prolific writer. He will appreciate his writings that he created. Even the imperfections in his complete and update it with takes time and patience. So that works really good quality, which is adapted to the circumstances. Because thoughts are briliyan Ibn Khaldun regarded as the foundation stone of the social sciences and political Islam. Basic education Qur'an adopted by his father to make Ibn Khaldun understand about Islam, and actively seek knowledge besides the Islamic sciences. As Muslims and hafidz Koran, he will uphold the greatness of the Qur'an. As said by him, "Know that the Koran education including religious symbols are accepted by Muslims throughout the Islamic world. By Qur'anic education because they were able to penetrate into the hearts and strengthening faith. And teaching the Qur'an properly is preferred before developing other sciences. "